(NO MORE BS) Magic Money Buttons, Unicorns & 4-leaf clovers! How Do You Really Make Money Online From Home? Are you tired of all the lies and scams how to make money online? I banded together with 2 other dudes (Matt Gill & Eric Louviere) who give a hoot about this industry and we’re gonna give you the straight scoop what really works. 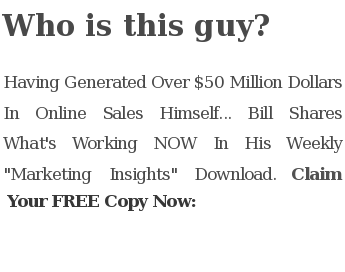 If we’ve generated over $30 Mil online, then we are quite certain that we can teach you how to AT LEAST create job-replacement income this year. Today is HUGE for both shoppers and business owners. Google has just released a feature for users of iPhones, Palm WebOS phones, or Android-powered devices. (Google’s blog post.) As of right NOW, if you do a Google search on your phone for a product, you will see a blue dot if that item is available at a store near you! On that screen you will also see if the item has full or limited availability, the price, which stores near you have the item, the distance those stores are from you at that exact moment, the phone number of the store, and a link to get directions with Google Maps. Although I discussed this topic on my live show right before Christmas this past year, it applies to all of us from time to time. So I wanted to mention it now. We often have the urge during traditionally “tough” economic times like holidays, to go into agreement with them, and blame those holidays or seasons for drops in our sales, low income, etc. What times are “tough” depend on what business you’re in. We say “Things are always slow this time of year” or “It’s the economy” or “It’s the holidays”. But saying those things doesn’t improve the situation, it just justifies low production.